One interesting tech trend that didn’t seem to draw any attention at a first-rate “Top Tech Trends” presentation at the American Library Association (ALA) 2015 Annual Conference here in San Francisco last month is inspiring me to write about the panel discussion nearly a month after it took place: the trend toward (and digital-literacy skill of) using online resources to extend a moment of conversation over a potentially very long period of time. The extended moment we’re going to have as a case study here is the one that began with that session on June 28, 2015, continues as I write this on July 31, 2015, and extends further into whatever day you’re reading and, with any luck, joining the conversational moment by responding to it. There were plenty of notable tech trends covered during that session (viewable in an archived recording) sponsored and facilitated by the Library and Information Technology Association (LITA), and I’ll return to those by drawing from what we might call a Tweeter’s Digest version created in the form of an edited Storify transcript of the tweets coming out of the session. But let’s focus, for a moment, on the larger, paradoxical situation/long-term trend in which we are, at the same time, driven to respond as quickly as possible online to what we encounter and yet, at the same time, are equally at ease finding something that has been online for an extended period of time before we discover and—more importantly—respond to it as if it were newly created rather than disdainfully treating it as something waiting for someone to breathe new life into it. That’s what we might call “conversing, fast and slow” if we were to puckishly name it by modifying the title of Daniel Kahneman’s thoughtful treatise Thinking, Fast and Slow. At a time when we are sometimes (mistakenly) encouraged to believe that responses to online posts (e.g., in Facebook, Twitter, LinkedIn, and a variety of other social media tools) must receive immediate responses if they are to receive any response at all, I’m encouraged to find that responding to older posts, articles, or other resources leads to some amazingly reflective and rewarding exchanges creating those very long moments I’m attempting to describe here. And that’s what is inspiring me to return to what some might consider to be “old news”—a brief summary and reaction to an event that happened last month—with the understanding that the delay in calling attention to the panel discussion is far less important than the act of extending the reach of that conversation via this article, the link to the archived recording, and the link to the Storify transcript which includes attendees’ initial in-the-moment reaction to the descriptions of the tech trends under review. An interesting and important theme connecting the various panelists’ tech trends descriptions was something library staff members often try to foster: collaborative efforts combined with a commitment to providing access to useful resources. As we heard about continuing efforts to provide “free, ubiquitous internet access in cities,” we had the visceral example of the LinkNYC project, a collaborative effort between City Bridge, New York City officials, and others; it’s designed to provide around-the-clock free Internet access and touchscreen-tablet interface with City services and other resources. As we heard about cross-sector collaboration as a tech trend, we had the possibility of previously-unimagined sharing of data between a variety of organizations in ways that served those using services provided by those organizations. And when we heard about an apparent renaissance in podcasting, we had colleagues jumping into the onsite-online conversation via Twitter to suggest partnerships between library staff and podcast producers, and other colleagues tweeting podcasts that might be of interest to those engaged in the session. There is plenty more to explore in the Storify transcript and the archived recording, but what brings us full circle here is the realization that by reading this article, following the links to resources of interest to us, and responding, we immediately become part of the extended moment that transforms a one-time panel discussion into part of a continuing conversation that enriches all of us, fast and slow. And adds to what we as trainer-teacher-learners can foster. N.B. 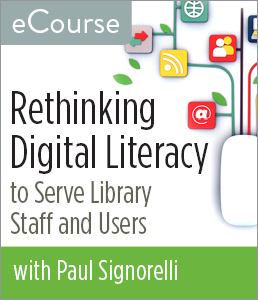 – This is the third in a series of reflections inspired by the American Library Association 2015 Annual Conference in San Francisco and the fourth in a series of reflections inspired by our ALA Editions “Rethinking Digital Literacy” course.